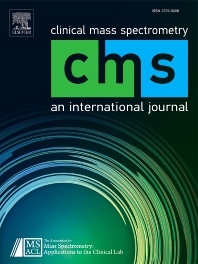 Clinical Mass Spectrometry publishes peer-reviewed articles addressing the application of mass spectrometric technologies in Laboratory Medicine and Clinical Pathology with a focus on diagnostic applications. It is the first journal dedicated specifically to the application of mass spectrometry and related techniques in the context of diagnostic procedures in medicine. The journal has an interdisciplinary approach aiming to link clinical, biochemical and technological issues and results. Beyond the application of mass spectrometric technologies in the routine clinical diagnostic setting, by publishing critically validated analytical protocols, Clinical Mass Spectrometry also addresses the translation of experimental techniques and analytical research into patients' care and the use of mass spectrometry in clinical research, studies, and routine patient care. The scope of the journal is not restricted to any particular mass spectrometric technologies, but covers the entire methodological range of mass spectrometry and hyphenated technologies. Types of papers: Reviews, full papers, short papers (letters, case studies, protocols, application notes), guidelines and best practice documents, tutorials, invited editorials.